ISLAMABAD, Jul 08 (APP):“Breaking all the traditional barriers and restrictions, I never imagined that the sound of my flute will echo in the biggest art platforms, state departments and diplomatic missions of Pakistan as well as abroad and give me immense recognition”. “All my relatives and friends who were habitual of criticizing me for playing a musical instrument and calling me `Miraasi’ now eagerly wish to listen my flute and attend my musical event”. Salman Adil is a Rawalpindi-based flute artist who alone is considered enough to enliven any musical event in twin cities of Rawalpindi and Islamabad with his outstanding performance and has a huge fan following within the country and abroad. At the age of 15 years, I memorized a traditional song “Lathey Di Chadar” on a piece of rough flute from my cousin considering it a toy and practiced that day and night for the sake of fun for many days”. “I could not realize how my fingers have started discovering different sounds and tunes from the six holes of this piece of wood”, Salman Adil said. 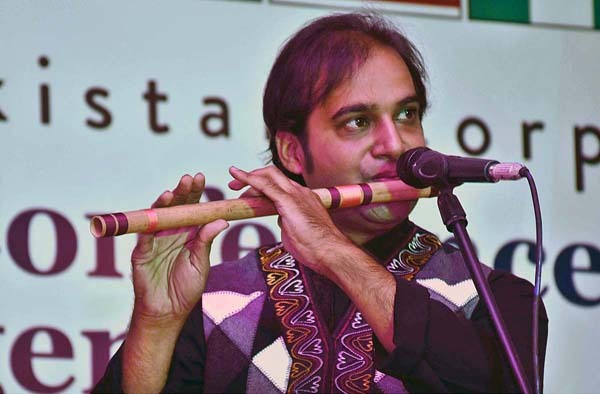 Salman Adil shared that he was blessed enough to discover the creativity flooded in him and polish his talent through guidance of his spiritual musical teacher, Ustad Babar Ali who is a Flute maestro and gained recognition through playing flute with renowned singers Attaullaha Esakhelvi, Madam Noor Jehan and manyothers”. “It was height of my passion that I used to play flute while sitting in the closet of my room with shut doors due to religious environment of my home, faced criticism from my family and relatives but never give up”, he said. My family was not supportive during start of my career rather afraid of what people will say about me and was thinking this instrument will ruin my whole life but started encouraging me after realizing that my talent is god-gifted and I cannot adjust myself in any other field of life. I started practicing different tunes and songs on flute day and night and entered into a world of “Raagas”, thoroughly studied, learned many things from internet and tried my best to achieve excellence in my work. Playing flute is not merely playing a musical instrument for Salman Adil but it connects him to spiritualism while taking him to another world of peace, love and humanity. “It was the sound of flute which I loved when I started playing it but then realized its purpose is not just to allure and entertain people but also transforming the lives of people by ending frustration, hatred and prejudices”, Salman Adil said. The difference between the flute played by me or other flute artists, according to Indian music researchers, is the element of spirituality that entered in my flute when I started following the music having elements of mysticism and the teachings of Sufi Poets like Baba Bhulley Shah, Molana Rome, Fariduddin Ganjshakar,Waris Shah, Amir Khusro and others, he said. “My soulful musical performances carry the element of truthfulness, which inherited from my (late) father who was a journalist and never compromised on truth and honesty. My profession for me is just like praying and I am playing my role to bring youth on right track through educating them”, he revealed. Salman Adil wished that artists’ community in Pakistan is given respect and theirdue rights. He observed that artists have no future in our country, they entertain the people until their health sounds well and when their health starts deteriorating, nobody cares them. The government must give patronage to the artist’s community and take steps for their welfare so that they bring more laurels for their county. Salman Adil is a trendsetter as a flute artist and imparted flute training to a number of students from across the country and abroad through social media. Around ten of his students are now working as professional flute players. He has represented his country through playing eastern and western music as well as instrumental fusion in France, Holland, Japan, India, China, United Kingdom,Lebanon, Saudi Arabia and Turkmenistan. Salman Adil has won many awards for his contribution in music industry at home and abroad, including PTV awards for two times.